This week we've made some improvements to the Duel Arena in addition to some new POH furniture and Zamorakian grape farming! 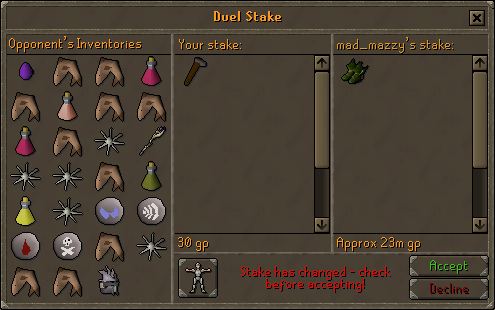 We recently put out a developer blog detailing a number of changes we would like to make to the duel arena in order to make the process of staking a safer one. 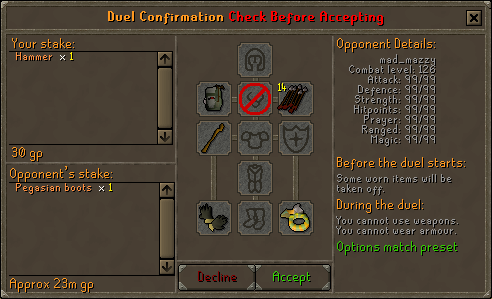 Following an overwhelmingly positive response to the suggested anti-scamming changes, we decided to make the changes without a poll. 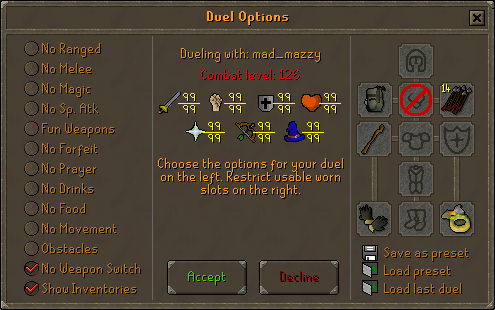 Let's take a look at what is different at the duel arena. The first screen you'd be faced with is the duel options screen. Here you decide what will be allowed/disallowed within the duel. As shown in the above image, you are now provided with much more information about your opponent. Not only do you see their combat level, but you also see each of their combat stats. The second screen is where you choose how much you would like to stake. Also, if you and your opponent agreed to show your inventories in the first screen, you will be able to view your opponent's items at this point. The button found at the bottom of this screen allows you to toggle between viewing your opponent's inventory and worn items. The third and final step in setting up a duel is confirmation. Here you can review all of the rules that were set and the items up for grabs. This ever so slightly longer process for setting up a duel makes sure you know exactly what you're getting into. With more information to hand, your time at the duel arena will be safer and more enjoyable! A Combat Dummy can now be constructed in your combat room. When you hit it, you will always roll max damage. An upgraded form of the dummy counts as being undead and as being your Slayer task, so the bonuses of the Salve amulet and black mask can apply to it. The dummy does not force enchanted bolts to trigger their special attacks every time, but will apply their max damage when they do, wherever that's applicable. 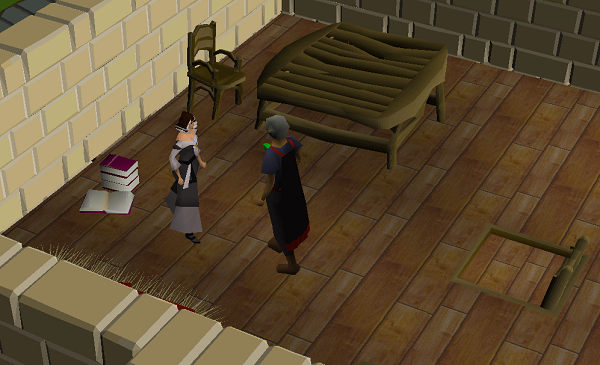 Farmer Gricoller's house in Kourend is now the home of Bologa, his youngest granddaughter. She's a Zamorakian mystic, or at least she'd like to be. Mostly she's worked as a bartender, but she's pretty sure necromancy is the career for her. Bologa has been combining her rudimentary Zamorakian powers with her family's knowledge of fruit-farming, and has invented a blessing that can infest a bunch of grapes with the power of her dark lord. To unlock access to her blessings, you'll need to pay Bologa 75k coins. She'll expect you to dress a little Zamorakian and have access to her grandfather's tithe farm (100% Hosidius favour) too. Bologa is upstairs in Farmer Gricoller's house. Once you've bought a stack of Bologa's blessings from Farmer Gricoller, carry them in your inventory when you harvest grapes. Each scroll will convert a grape to a 'Zamorakian grape' at the time when it is severed from the vine. 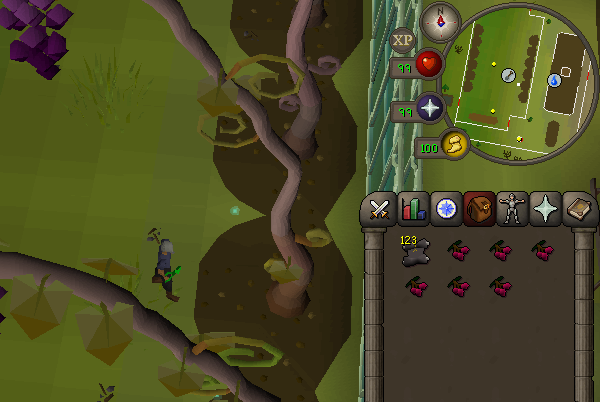 You can then add the Zamorakian grapes to a jug of water to make Wine of Zamorak in the usual way, with level 65 Cooking. The questions in the Stronghold of Security have been updated. Players with 200m in a skill now have an increased chance of acquiring the skill pet for that skill. The left-click option on fairy rings now teleports you to Zanaris. The right-click “Configure” option allows you to select the destination. Players can now sell penance equipment back to the Barbarian Assault NPC for 80% of its original cost. Watson can now be contacted via the NPC contact spell. There's now a table by the bank chest in the Vinery. Count Check, the security vampire, will be arriving in Lumbridge on Monday near the other guides to talk about account security. 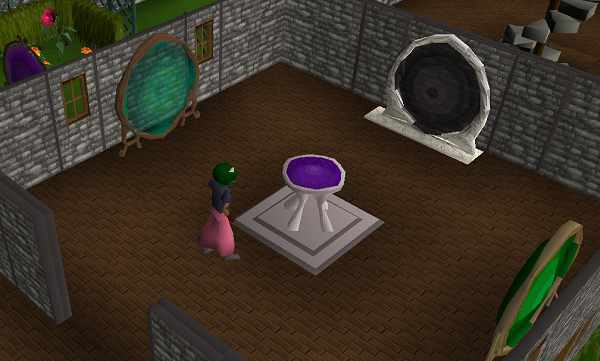 The Holy Book colours have been adjusted to be more in line with Saradomin’s colours. Superior Slayer Encounters spawned in Nieve’s cave can now be killed off task. The Ape Atoll Agility course now grants its completion XP only if you have completed the entire course. A graphical issue has been fixed with the chathead of Percival, from the Holy Grail quest. The Mining skill-guide now shows lovakite ore as members-only. Some grammar has been fixed in the canoe dialogue and in Monkey Madness II. 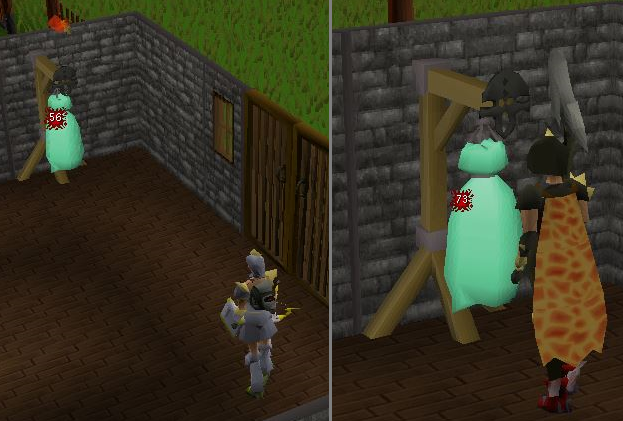 Unsubscribing while in the Warriors' Guild no longer leaves you in Lumbridge with barrels stuck on your head. Very nice Poh updates once again.